43.5 mm stainless steel case with anti-magnetic properties and helium escape valve, transparent back, screw-in crown, unidirectional rotating black ceramic bezel with Liquidmetal diving scale, domed scratch-resistant sapphire crystal with anti-reflective treatment on both sides, black ceramic dial, caliber 8900 self-winding master co-axial chronometer movement with date window at the 3 o’clock, approximately 60 hours of power reserve, stainless steel bracelet. Water resistant to 600 m (2000 ft). 43.5 mm stainless steel case with anti-magnetic properties and helium escape valve, transparent back, screw-in crown, unidirectional rotating black ceramic bezel with orange rubber and Liquidmetal diving scale, domed scratch-resistant sapphire crystal with anti-reflective treatment on both sides, polished black ceramic dial with orange Arabic numerals, caliber 8900 self-winding master co-axial chronometer movement with date window at the 3 o’clock, approximately 60 hours of power reserve, stainless steel bracelet. Water resistant to 600 m (2000 ft). 43.5 mm stainless steel case with anti-magnetic properties and helium escape valve, transparent back, screw-in crown, unidirectional rotating blue ceramic bezel with Liquidmetal diving scale, domed scratch-resistant sapphire crystal with anti-reflective treatment on both sides, blue ceramic dial, caliber 8900 self-winding master co-axial chronometer movement with date window at the 3 o’clock, approximately 60 hours of power reserve, stainless steel bracelet. Water resistant to 600 m (2000 ft). 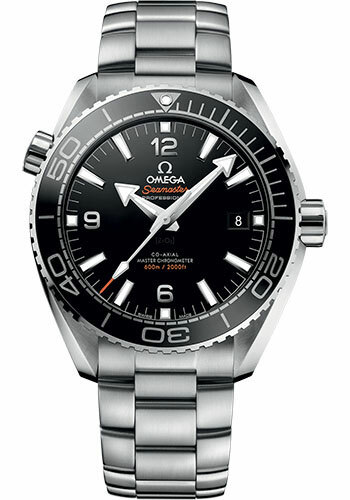 43.5 mm stainless steel case with anti-magnetic properties and helium escape valve, transparent back, screw-in crown, unidirectional rotating black ceramic bezel with orange rubber and Liquidmetal diving scale, domed scratch-resistant sapphire crystal with anti-reflective treatment on both sides, polished black ceramic dial with orange Arabic numerals, caliber 8900 self-winding master co-axial chronometer movement with date window at the 3 o’clock, approximately 60 hours of power reserve, black structured rubber strap with orange stitching and lining. Water resistant to 600 m (2000 ft). 43.5 mm stainless steel case with anti-magnetic properties and helium escape valve, transparent back, screw-in crown, unidirectional rotating black ceramic bezel with Liquidmetal diving scale, domed scratch-resistant sapphire crystal with anti-reflective treatment on both sides, black ceramic dial, caliber 8900 self-winding master co-axial chronometer movement with date window at the 3 o’clock, approximately 60 hours of power reserve, black leather strap with rubber lining. Water resistant to 600 m (2000 ft). 43.5 mm stainless steel case with anti-magnetic properties and helium escape valve, transparent back, screw-in crown, unidirectional rotating blue ceramic bezel with Liquidmetal diving scale, domed scratch-resistant sapphire crystal with anti-reflective treatment on both sides, blue ceramic dial, caliber 8900 self-winding master co-axial chronometer movement with date window at the 3 o’clock, approximately 60 hours of power reserve, blue leather strap with rubber lining. Water resistant to 600 m (2000 ft).